As part of our ongoing commitment to offer the leading all-round performance bike position package on the market, Drag2Zero have been working to bring the measurement tools of aerodynamics and biomechanics together. The holy grail for any athlete is to find the sweet-spot between comfort, power and reduced drag, and clear forms of measurement are immensely useful for those with the technical knowledge and experience to interpret the data. Those who have attended one of our Drag2Zero AeroFit sessions over the past year will have met our new team member Rob Lee. Here we get to know him a little better and also find out a little more about the D2Z Aerofit sessions. D2Z: You’ve been working on this with Simon for over a year now, tell us a bit about how this came about. Rob: I’ve been involved with coaching since the mid 90s, and started learning some fairly rudimentary bike fitting techniques in 2004. During the early days that interaction had always been with mountain bike athletes, due to my background in that sport, but in 2013 my wife took an interest in time trialling and following some local success coaching her, I was approached by another local athlete who wanted to give TT a try. Having followed the progression of most cycling disciplines, and having a close friend who had already benefited from a visit to Drag2Zero, I told my new athlete that the best place we could start was with a session at the Mercedes wind tunnel with Simon. Between that session and coaching the results came fast and before too long I was coaching as many TT racers as mountain bikers. In 2015 I decided to give the discipline a go myself, I’ve always done a bit of time trialling as part of my training but never fully committed to the bike and specific training. Racing is much more a hobby and enjoyment for me now, than the serious must win endeavour it once was, but once a racer always a racer to some degree! As a fitter and coach I started looking at improving my times with position from the offset, starting with various bike fits, progressing to aero track sessions by the end of my first season. It struck me that whilst I was making progress there was a significant gap between the areas of biomechanics and aerodynamics in terms of support and information given to the athlete. On going to the Mercedes tunnel with Simon (Smart) things started to fall into place a lot more, and we also got talking about how we might bring the two areas together into one package, or a progress of packages suitable to different levels of athlete development. D2Z: So Have you nailed it? Rob: I’d say we are in a position where we can safely say we offer something unique and a step up from any of the aero fit solutions on the market that I’ve seen or experienced. There’s always room for improvement, areas of technological and theoretical advances. We know ourselves that we are exploring new ideas all the time, and learning continually, so there’s certainly scope to bring a more advanced package to market. At the moment though I’m really confident that we have a rock solid offering, based on current thinking and understanding of the body, coupled with the highest accuracy currently available. We offer a complete package and support to ensure the athlete has a real world solution and the end results are speaking for themselves: athletes of all levels are setting new PBs after visiting us, we’ve seen competition records, course records and athletes that have even gone faster again after a session to convert a seriously fast, but non-UCI legal position, into one that they can race at Albi and bring home a jersey. D2Z: what have been the most interesting things you have learned or observed so far? Rob: The biggest surprise to me is how many athletes we’ve had visit us after already attending a different type of aero assessment because they need more clarity and a complete solution. The data is good but from the perspective of the end user they need to know exactly where their hands need to be located, what parts needs to be replaced on the bike, and all the measurements to get that bike set up correctly. Lots of athletes also need clarification and education on what their position should look like, and the cues they can develop in training in order to replicate that position out on the open road. Riding in TT position in the alien environment of a track, for instance, is something that 99% of us are complete novices at. Transferring that position to a turbo trainer or the road is quite difficult for a lot of us. I used to think otherwise – riding has got to be better than static testing right? – but the feedback from many athletes mirrors my experience that it’s no more real world than the tunnel. As a follow on to this we find that measurements are critical, the athlete’s that visit Drag2Zero get a full map of the dimensions of the bike and contact points, and we also have this record when their team mechanic, or local bike shop, contact us so they can fit new poles in the correct position to replicate the position. I was surprised that this wasn’t included in some of the services I used prior to going to Drag2Zero. I’m not surprised that it’s part of the Drag2Zero system. 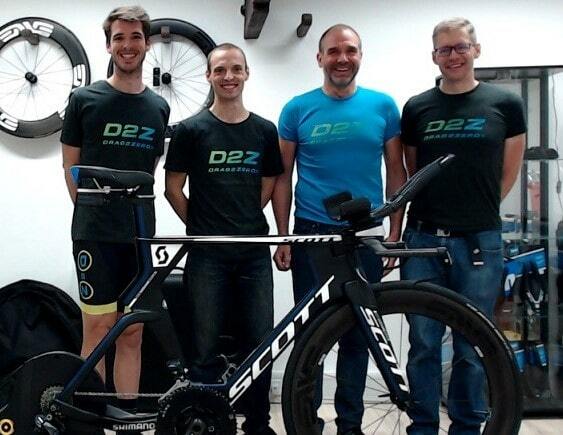 D2Z: so how has your own time trialling been going? Rob: I visited the tunnel in November 2016 and then trained in position for pretty much every session that Winter. In April 2017 I was hit by a car whilst out for a ride which left me with 3 spinal fractures and a few other less serious injuries. 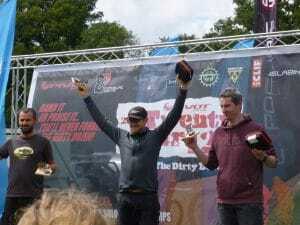 Racing TT last season was written off as a result, although I did race a couple of mountain bike events and won the Torchbearer 12 hour solo, so I know the winter fitness was there. At the moment I’m still transitioning back to a good aero TT position in training, and I trained in my tunnel position for the first time since the accident last week. Physiotherapy is still ongoing, as is recovery, so this year I’m focussed on some longer events, racing the 2500km TransAtlanticWay self supported race in June as my main goal. I hope to do a few time trials at the end of this Summer with a view to having another go in 2019. D2Z: good luck with your racing and we look forward to our continued work together.